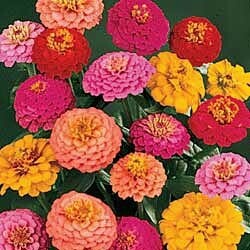 California Giant Zinnia-(Zinnia elegans)- The colorful blooms of the California Giant Zinnias make wonderful cut flowers. The flat-petaled semi-double flowers are displayed on long, graceful stems. Plants are easy to grow and bloom midsummer through fall. An excellent backdrop for other annuals in flower beds and borders.This annual flower reaches heights of almost 48 inches. Colors bloom in Pink, Rose, Red, Scarlet, Coral, Orange, Red-Orange, Gold and Pale Yellow. Attracts birds, bees and butterflies. Plant in full sun in well drained soil. Can also be grown in containers.